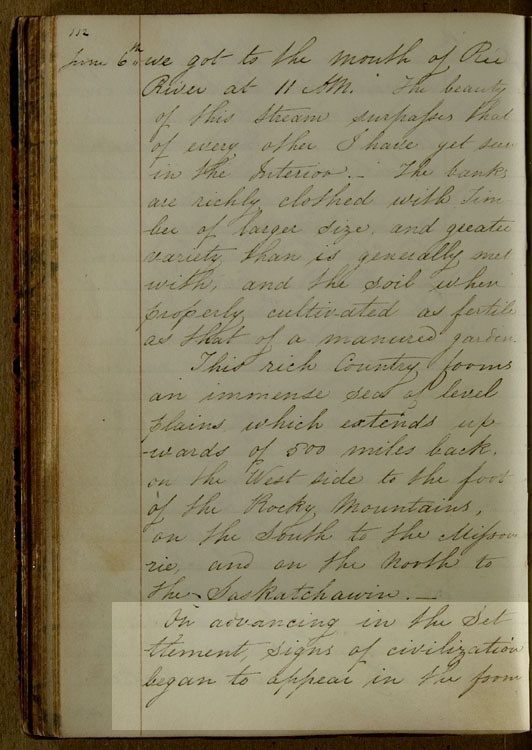 This entry from the journal of her first canoe trip is dated June 6th. They have just entered the Red River for the journey up to Fort Garry. p14, 4th & 5th pghs: "On advancing... pay me a visit." "On advancing in the Settlement, signs of civilization began to appear in the form of houses built of Logs, and surrounded by patches of ground which bore the marks of the Plough & the Spade: from this point, cultivation is continued along the banks with very little intermission, as far as nine miles beyond the Fort, which is situated 50 miles from the mouth of the River. As the houses and farms increased in magnitude, & improved in quality, the pleasing & domestic sight of Cattle appeared, which added much to the beauty and interest of the Scene. About 2 O’clock we came to an Indian Camp, the Chief of which was recognized as “Peguish” or the “Cut-nosed Chief”, who embarked in his Canoe, attended by six or seven of his followers, to congratulate Mr. Simpson on his return, he being very popular among the Indians, on account of treating them with uniform kindness: which in my humble opinion (except perhaps in extreme cases) is the surest way towards attaining the desired end of improving their condition; as it is far more likely to succeed in weaning them from their savage life & roving habits, than authority harshly exercised could be - and they are thus frequently induced to give up the fatigue & uncertainty of the Chase, for the more peaceable and certain occupation of husbandry. The Chief welcomed me very cordially in his Native Tongue, to his “Native Land” - shook me by the hand several times, and promised to come to the Fort next day to pay me a visit." Peguis (c. 1774-1864) was a noted Saulteaux (Ojibwa) chief, whose people are still settled at Netley Creek (south of Lake Winnipeg). He had been a valuable friend and ally to the early settlers of Red River, and signed a treaty with Lord Selkirk in 1817. He was known as "the Cut-nosed Chief" because part of his nose had been bitten off in a quarrel round about 1802.